Casavalle is one of the poorer neighborhoods in Montevideo, with 79% of the population living in poverty and 70% of people between the ages of 17 and 65 years old not having completed a high school education. Sadly, the only school in the community—the free secondary education institution of Liceo Jubilar Juan Pablo II—is unable to meet the demand for education within Casavalle. 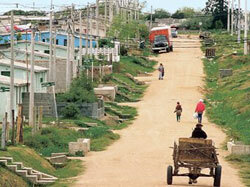 Casavalle is also a high crime neighborhood, so that visitors are asked to avoid this area.